You may have seen that the twitterverse was all, um, a-twitter this morning over the pending expansion of tweets to 280 characters. Personally, I think this is a bad move – the only thing that makes Twitter stand out from the jostling crowd of other social media is its brevity. Concise = good. Blathering = all bad. And believe me, I know all about blathering. That said, the change is coming. Maybe. Maybe not. Twitter claims that they are testing the new limit right now with “a small group” of users and they haven’t fully committed to the change. Who is this “small group”? How were they chosen? And how do you get to be included? Not a clue … and Twitter isn’t saying. But guess what? You can do an end-run around the Twitter glitterati add yourself to the “small group” with about 30 seconds of your time and a few clicks of the mouse. All you need is a copy of Chrome and the ability to copy and paste. Ready? Lets go! STEP 1: Fire up the Chrome browser and head on over to Tweetdeck at TWEETDECK.TWITTER.COM and log in to the Twitter account you want to add to the party. 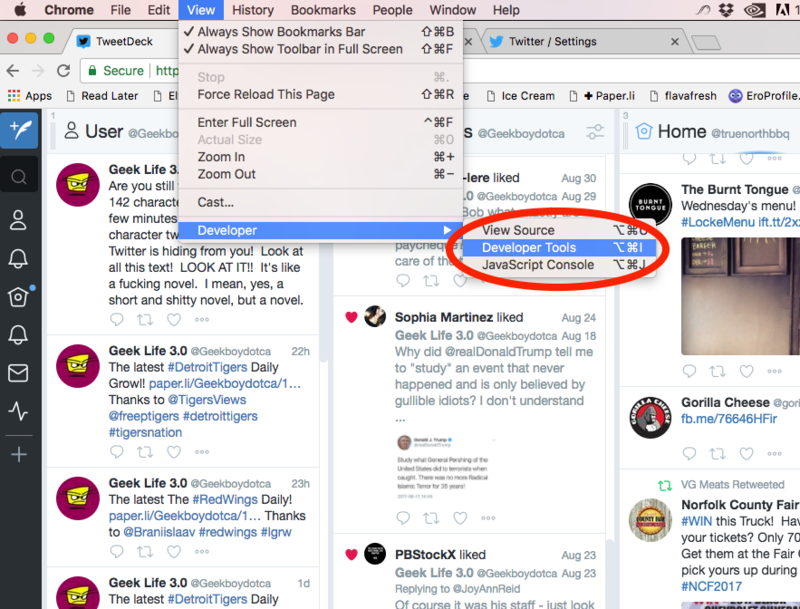 STEP 2: Open up the View menu in Chrome, and then slide down to the bottom of the menu and under Developer click on Developer Tools. 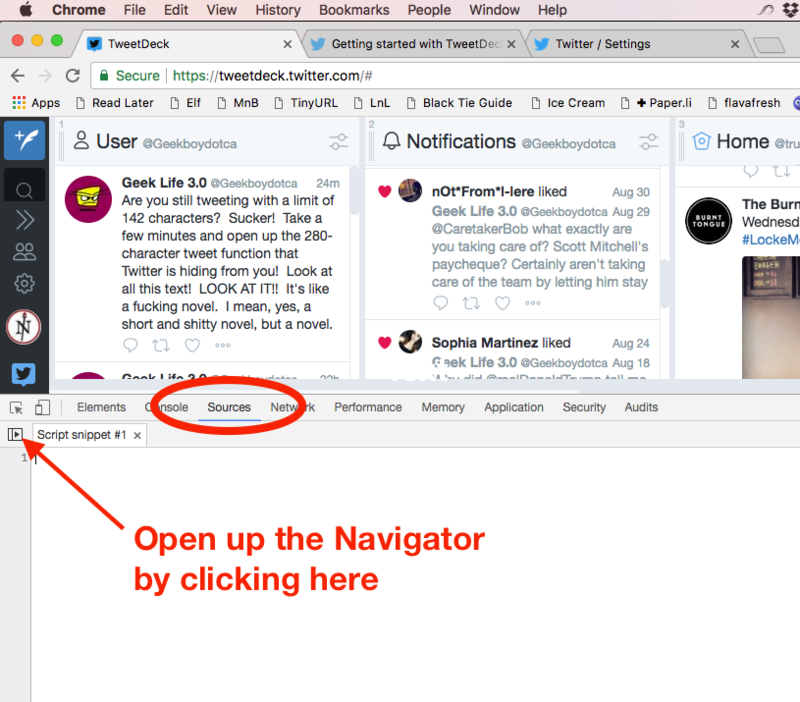 STEP 3: In the new Developer pane that appears in the bottom half of your window, click on the Sources menu and then expand the Navigator by clicking on the little “expand” icon. 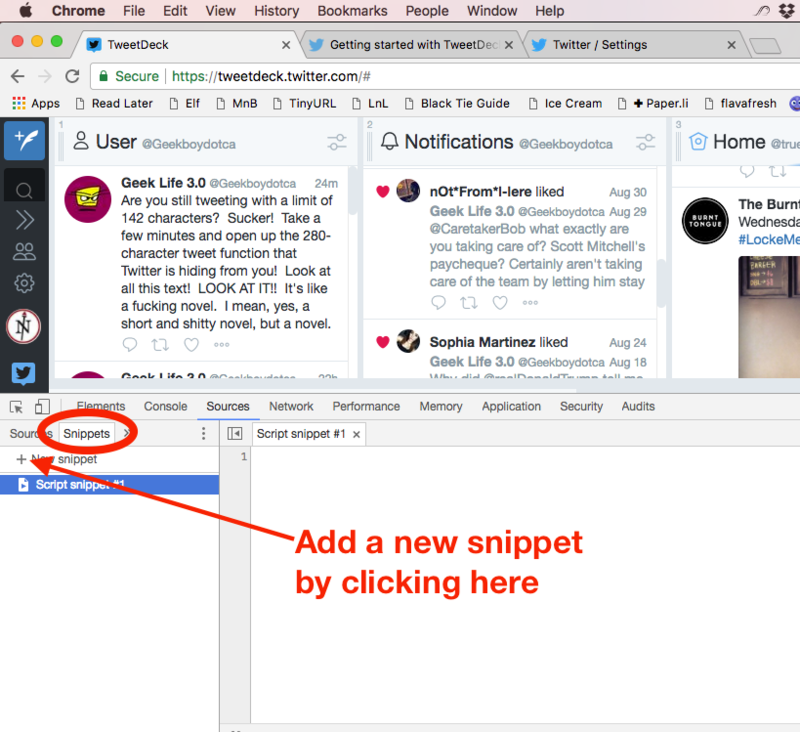 STEP 4: In the Navigator click on the Snippets tab and then click on New Snippet. 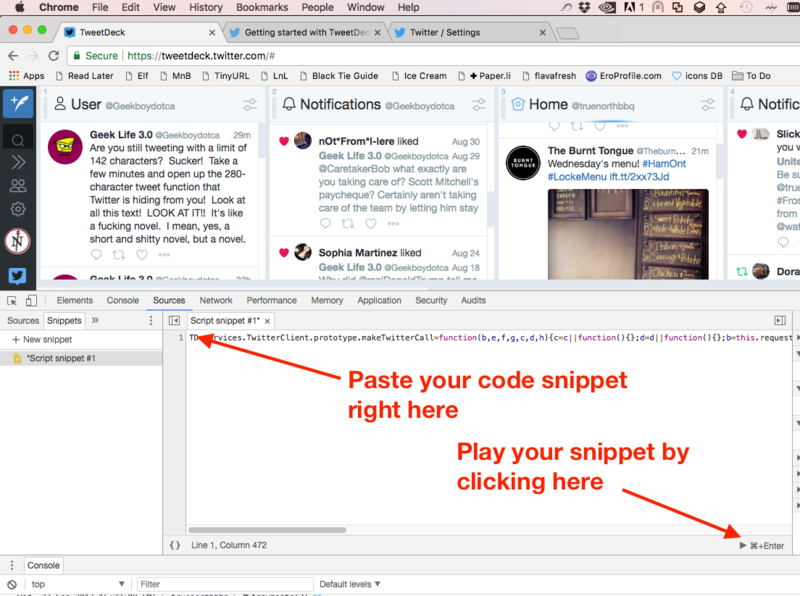 STEP 5: Paste the following chunk of code – make sure you get it all – into the Script Snippet window as a single line (if your browser breaks into two lines just use the Delete or Backspace key to get back to a single line) and then click the “Play” button down in the lower right. STEP 6: There is no sixth step. You are done. Now get out there and use those shiny new 280 character tweets.